This page is about the history of the studio and my work. It includes details of how I came to do pottery and photos of early works as well as things to look for if you are currently a collector of my work. In the weeks that followed, his predictions came true as the students saw that his class had the academic rigor of any of the harder classes at the University. He held students to a very high level of performance and required demonstration of good design, imagination and technical mastery. I realized at once that I had found my true calling and sold my first works at the Ceramics Group art show that fall. The pots from that time number no more than 100 and are for the most part crude when compared to today’s work. In the spring of 1974, I built my first kiln, a potter’s wheel from parts salvaged from an old Maytag dryer and set up a small studio in the upstairs of my house in Lewiston. Everything produced from 1974 to the spring of 1976 was made in that 144 square foot studio. Bottom prints from that time look like the picture below. At first, they were incised by hand. In the spring of 1976, I built my first studio behind the house. At 720 square feet, it seemed huge, sported 2 kilns and lots of shelf space. 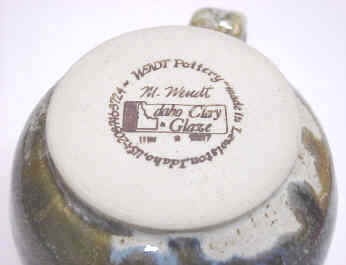 By then, I was making so many pots I resorted to wet stamping, but these were hard to read. 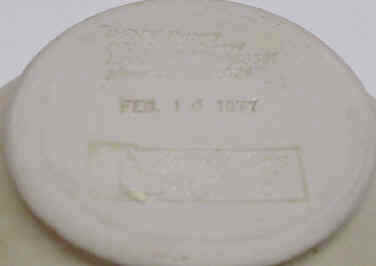 The last of the impressed stamps were often stained to enhance readability. I worked there from then until 1980 when Mt St Helens erupted and changed my life completely. 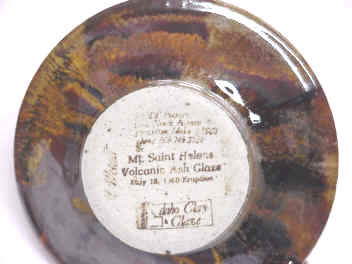 The demand for ash glazed work was astounding and still is. 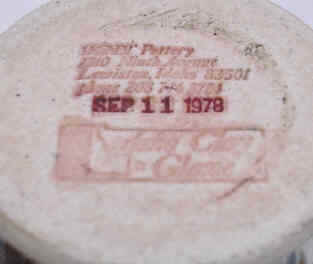 Below is an early bottom stamp from that year. After practice, the stamp became much clearer and easier to read. For those interested in using this marking method, call me for a class on the subject. I believe it is the bottom stamp in conjunction with my willingness to do precision custom work to customer specifications that has lead to my continued success. 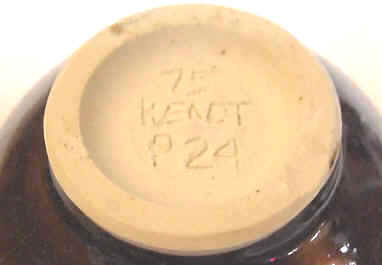 Each year, I receive hundreds of custom orders from all over the U. S. thanks to the stamps on the bottoms of the pots. Today my studio is over 10,000 square feet with work space for four full time potters (currently it is just me) and kiln capacity to fire well over 100 cubic feet per month.